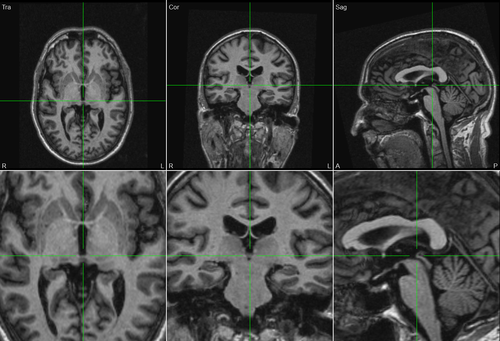 In BESA MRI, the transformation of the original data into the ACPC coordinate system is defined by first marking the middle of the anterior commissure (AC). Then we rotate the MR image to obtain an optimal view of the ACPC plane (PC = posterior commissure) and the best separation of both hemispheres by the sagittal plane. The marking of the PC completes the transformation step. 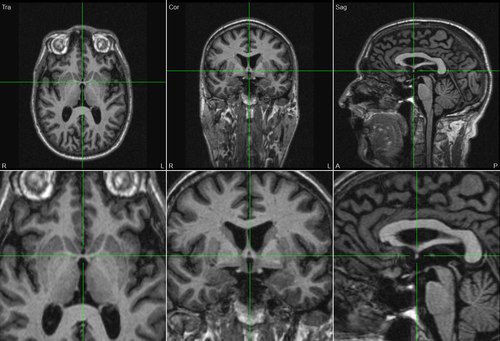 A quick guide to locate the AC and PC in BESA MRI, on a structural MR image, is given below. the sagittal plane separates the two hemispheres optimally. It is also recommended to increase or decrease the zoom factor accordingly, to better localize AC and PC. 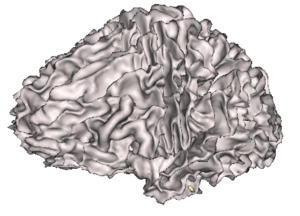 Mismarking of the AC and PC points can cause the shrinking or expanding of the central brain regions during the transformation process, which yields deformed Talairach-transformed 3D models of the brain. This can be avoided by carefully marking the AC and PC point as described before. The effect of mismarking can be also seen on the “Set Talairach Transformation” screen as shown. This might prove helpful in assessing the correctness of the AC-PC marking at an earlier stage. This page was last modified on 5 September 2017, at 11:37.